Going on a trip soon? It is spring break time. If you are like me and get a little antsy in the passenger seat because it isn't always quite comfortable, then you might enjoy this product I have to share with you today. I was sent an AirComfy Travel Pillow through the Tomoson website for my honest review. I'm pretty excited to share it with you because this is right up my alley! The AirComfy Travel Pillow comes in a nifty little carrying bag. It fits in there quite snug so I'm wondering if I'll be able to get it back in. I'm sure with a little work I'll do fine. Here it is out of the bag and not inflated yet. (You can see the air valve). This is a great for carrying onto a plane. It doesn't take up much space and you can pull it out and inflate when you are ready! It is supposed to self inflate within seconds once you turn the nozzle to open. Maybe mine sat in the bag too long. I had to blow into the nozzle. It was quite quick and easy though, so no complaints. This design allows for full neck support without making you feel claustrophobic like it's competitors whose sides encroach on your face. The material is also easy to clean. Just wipe with a damp cloth! Above is how the pillow looks fully inflated. Worried about the pillow slipping while you snooze in the car? Don't worry, they thought about that as well! I don't know about you. . . but this pillow gives me more ideas. I think I might use it for a bubble bath pillow when I'm not traveling. HA! For more information about the AirComfy Travel Pillow, check out their website. Getting ready to sell a house is a lot of stress and a lot of work. The past 2 weeks have been super busy that between work and getting ready to list our house at home, we've hardly had time to ourselves. 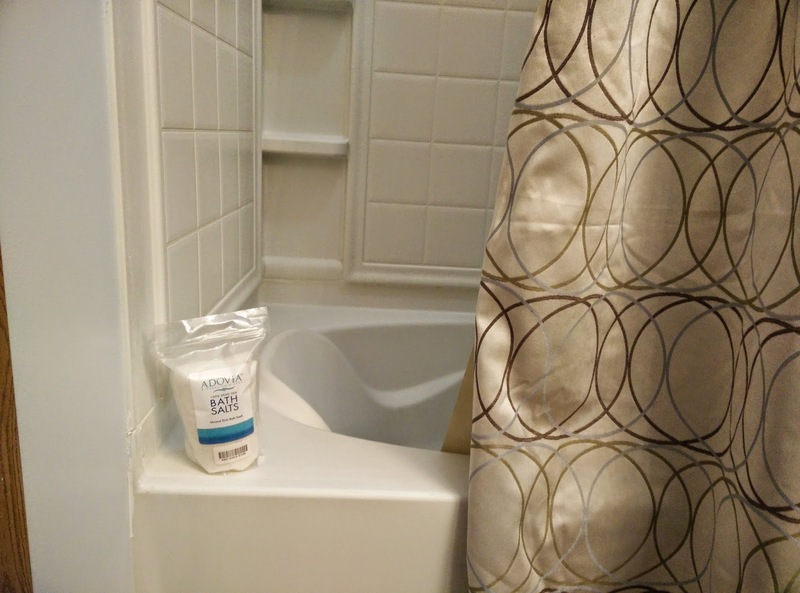 This is why I am so thankful for having received Adovia Dead Sea Bath Salts from Adovia and Tomoson to review for you! Talk about relaxing!!! These bath salts are a fine grain to help with faster dissolving time. They are also packaged in a resealable bag. The bath salts are said to provide relief from Psoriasis, Eczema, and Arthritis symptoms. While I do not having any of these symptoms I did highly benefit from soaking in a nice hot bath with these. My skin was left feeling silky smooth and I was relaxed and ready for another day.